It’s been a great year for Summertown Interiors in delivering against its CSR objectives, and we are proud to announce that Summertown has scooped its 3rd business accolade of the year. 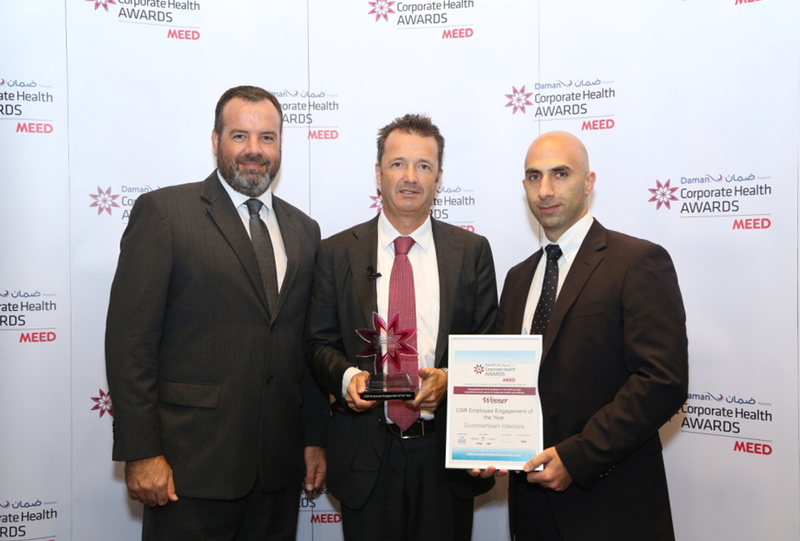 On 5th November 2014 we were presented the CSR Employee Engagement of the Year Award at the Daman Corporate Health Awards in Abu Dhabi. Summertown beat off stiff competition for the award which included some of the regions leading organisations that are well renowned for their CSR practices. The panel of judges praised Summertown for its integrated approach to CSR and the variety of initiatives in our CSR program that engage our employees to promote employee wellbeing, community support initiatives and activities that support our drive towards carbon neutrality. Earlier this year, Summertown was recognised for its CSR practices by Dubai Chamber, having received for the third year running the CSR Label. Summertown Interiors also recently won the ‘Sustainable Business of the Year’ award presented during the Gulf Capital SME Awards in October 2014.